These are some random insights into the mind of Joe DeShon. If you read this, you'll be amused, entertained, and occasionally enraged. But at least you'll understand where I'm coming from. C-SPAN has just published the 2017 results of their Presidential Historians Survey. As any good data geek would do, I threw all the data into Excel to see what I could discover. You can download my work here. I’ve always been interested in these types of studies because, on the one hand they advertise themselves as being totally objective, it’s really hard to squeeze the subjectivity out of them. After all, any historian — no matter what he claims — brings to the table a certain amount of historical bias. Today’s political climate tends to make that bias even more obvious. For example, Glen Beck — admittedly nobody’s example of political objectivity — ranks Woodrow Wilson as the most evil man in all of American history. 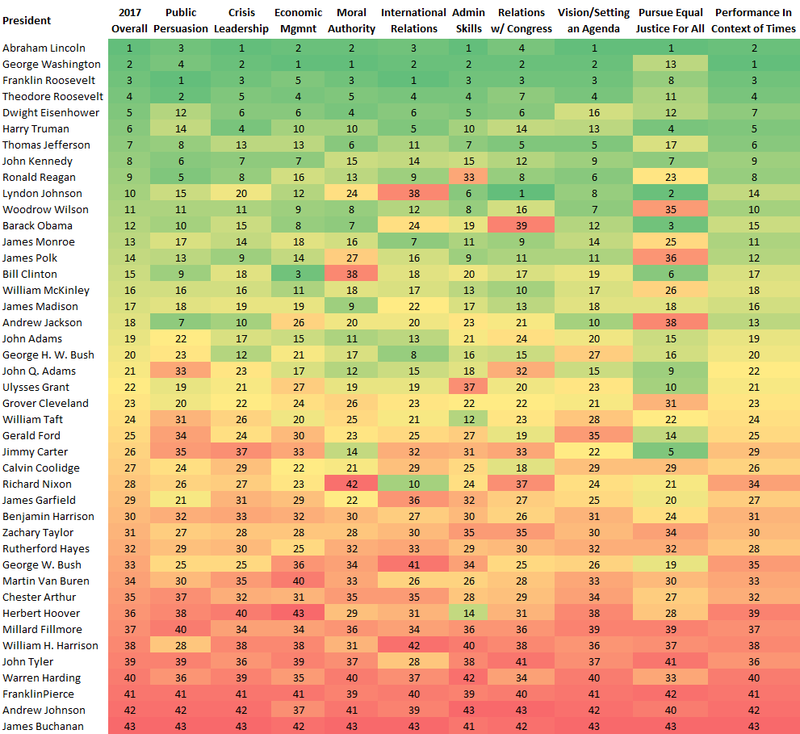 But the survey ranks Wilson a respectable 13th out of 45. And James Polk — not on the general public’s list of great American Presidents — ranks number 16 — proof that the C-SPAN academic advisors sure know their pre-Civil War history. It’s probably a good idea that such a panel is used and that they don’t ask me or Glen Beck to serve on that panel. All those categories gave me plenty of data to load into Excel. Let’s see what I discovered. 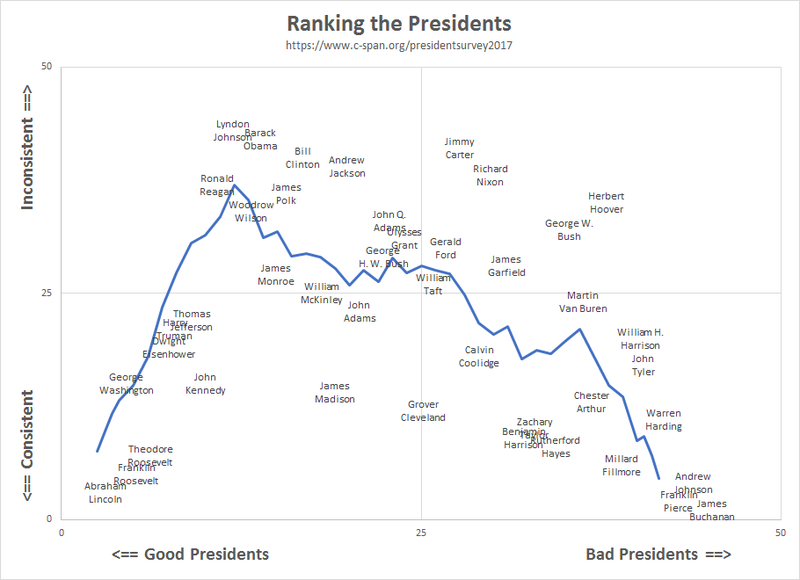 I thought it would be interesting to measure the presidents on a combination of rank and “consistency”. I measured consistency based on the rank of the standard deviation of the rank in for that president in all the categories. A consistent president is one who ranks the same in all categories. A president may be consistently good, consistently bad, or consistently mediocre. Is there anything to learn from this? To validate the data, let’s look at a couple of corners. Yep, not only does Abraham Lincoln rank as the number one president, he ranks as the most consistent president. That places him in the lower left corner. A good president all around. In the other corner are both Lincoln’s predecessor and his successor. Wow. We always knew that James Buchannan did more to cause the Civil War than any other individual. And we know that Andrew Johnson did more to screw up Reconstruction than just about anybody else. Bad presidents all around. Thanks for the legacy, guys. 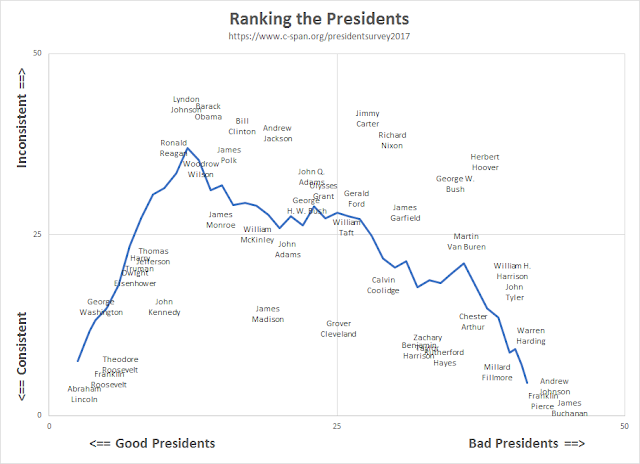 This graph color codes the presidents by their rank in each of the ten categories. Since they are ordered by the final score, any place you see “islands” of a different color, that’s an anomaly that’s worthy of discussion. For example, Lyndon Johnson was a pretty decent president. He ranks at the top for “Relations with Congress” (he had to fight his own Democratic Party to get the Voting Rights Act of 1965 passed; a greater percentage of Republicans voted for the bill than did Democrats). But he rightfully ranks near the bottom for international relations for getting us deeper in the Vietnam war. Bill Clinton ranks a decent number 15 overall, but comes in near the bottom in for “Moral Authority” because of his fondness for oral activities. It’s a little harder for me to explain the person that I believe to be the nicest, worst president of them all: Jimmy Carter. A dreadful president who ruined both the American economy and our relations with Iran, I don’t know how he ranked as high as number 26. On the other hand, he’s a decent man in a strong, loving marriage, a Baptist deacon and Sunday School teacher, and a Habitat for Humanity volunteer into his 90s; doesn’t he deserve to be ranked higher than number 14 in “Moral Authority”? And how did Barack Obama perform in his debut appearance? He came in at number 12, between Woodrow Wilson and James Monroe. That’s probably fair. He ranked near the bottom in “Relations with Congress”. The only way he got ObamaCare passed was with back-door deals and a “gotta-pass-the-bill-before-you-read-it” mentality, even though his party controlled both houses of Congress at the time. He also scored pretty low on “International Relations” by touring the world while apologizing for America’s past policies, weakened our position with Russia, and managed to worsen our relationship on both sides of the Middle East — quite an accomplishment! He scored the highest in the category “Pursued Equal Justice for All”. That sounds about right for somebody who thinks “it’s good for everybody” to “spread the wealth around”. We’ll have to wait a few years to see what historians think of our Mogul-in-Chief. My guess is his drain-the-swamp and build-the-wall dreams will score high in the “Vision/Setting an Agenda” category. Fortunately for Mr. Trump, there is no category for “Relationship with the Press”. The Mind of Joe is now a book! Copyright © 2010 - 2017 by Joe DeShon. Awesome Inc. theme. Powered by Blogger.